This snapshot of the “US Educational Industrial Complex” made the rounds via social media over the weekend. The title says “snapshot,” I realize, but I have to point out that it’s missing a lot of information, particularly related to educational technology and venture capital. It highlights “biggest players” as the Gates Foundation, the Walton Family Foundation and the Broad Foundation. Indeed these philanthropic organizations do grant hundreds of millions of dollars a year to various ed-reform efforts. But reform isn’t simply a matter of philanthropy; it’s a matter for business too. The image posits several key nodes that aren’t philanthropic orgs: Pearson and Salmon River Capital, for example. I’m not certain why the latter is the venture capital firm highlighted. Its portfolio includes Capella Education Company (parent company to the for-profit Capella University) and Parchment (the latest startup by Blackboard founder Matthew Pitinsky, whose name is misspelled on the image). The image does link Salmon River Capital to other powerful nodes, notably through Ted Mitchell who now serves as the Undersecretary of Education. But Mitchell was also the CEO of NewSchools Venture Fund – a fund supported in part by the Gates Foundation and I'd contend far more influential in ed-reform than Salmon River Capital. NSVF invests heavily in the charter school and ed-tech startup space. Its portfolio includes ClassDojo, Edsurge, the Edcamp Foundation, Khan Academy, KIPP, and Rocketship Education. Also missing: Learn Capital, another venture capital firm that invests exclusively in education, whose biggest limited partner is Pearson. Learn Capital’s portfolio includes AltSchool, Coursera, Edsurge, and General Assembly. Also missing: Deborah Quazzo, the founder and managing partner of GSV Advisors, another venture capital firm that invests heavily in education. She resigned this summer from her position on the Chicago Public Schools Board, following scrutiny into how her investment portfolio profited from doing business with the district. GSV’s portfolio includes 2U, Coursera, Edsurge, Dreambox Learning, and General Assembly. 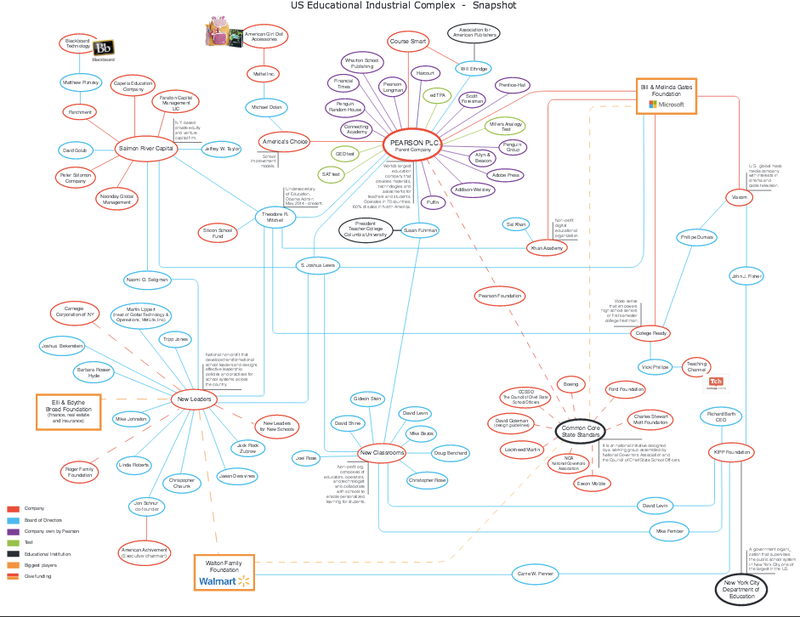 My point (in part) is that the “educational industrial complex” is incredibly complex, and this particular image does not depict that very well or very thoroughly. Take 2U, for example, mentioned above. Its founders: John Katzman, best known perhaps, as the founder of the test prep company The Princeton Review. He’s also the founder of a company called Noodle and an investor in ed-tech startups, including Edsurge. 2U’s other founder (and currently CEO) is Chip Paucek who was also once the CEO of Hooked on Phonics. 2U, before IPOing last year, shared investors with Blackboard and Parchment. I’m fascinated by these relationships. It’s partially why I track on ed-tech startup investment. I want to be able to draw a better map – although in my case I use words and not visualizations. And even if the data in the Educational Industrial Complex map is partial, I worry that the visualization aspect makes it even more misleading. We can’t tell how much money (how much power) these different nodes contribute to shaping education policy. There is no data for us to view for ourselves: how much does the Gates Foundation invest? How does that compare to the Broad Foundation? How much money does Pearson make from the GED? How does that compare to the SAT? To its Common Core-related exams? Do the lines and the bubbles accurately visualize the money or the power? I’m not convinced that they do. As I've stated already it's worth asking what data is missing here? A lot, I’d argue. (A line between the SAT and Khan Academy and the Common Core, for starters. The world of venture capital and its connections to the Common Core and to the Gates Foundation and to the Department of Education.) What "counts" as "education reform"? Who counts and who's implicated -- and according to this graphic at least, who's let off the hook?